Resoconto completo, pubblicato sulla Rivista del CAI, n° di Maggio/Giugno 1999. Cercando Samarkanda. Pubblicato sul Bollettino del CAI Lecco n°3/98. 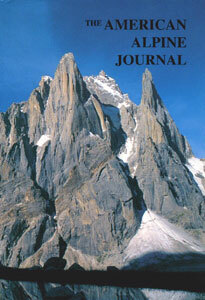 The AMERICAN ALPINE JOURNAL 1999, Editor Christian Beckwith, by The AMERICAN ALPINE CLUB. On our latest climbing trips we have always tried to visit unpublished sites. This comes with the high risk of making a deep blunder. This year our attention was hooked by an unknown valley between the weel-known Karavshin and Laylyak regions of the Pamir Alai. We (Paolo Vitali, Sonja Brambati and Eraldo Meraldi) had an excellent first contact with locals, hearty and expansive people who opened up their houses to us and as they would to friends. With these good beginnings, we started our trip in the Laylyak Valley, then crossed the Aktubek Pass (4300 m) to reach our objective: the Ortochasma Valley. Unfortunately, we were unlucky - we found no granite there at all there, only pudding-stones and loose rocks. After our initial disappointment, we had to make a demanding decision: go back? Do a trek only? What else could we do? Consulting the cyrillic map with Ranger, our best horse driver, we understood that with two additional long walking days we could reach the Karavshin region, where the granite is certain. After ten hours' walking for five days, we finally reached the nice grassy Karavshin base camp. 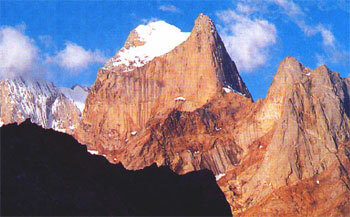 Lots of great routes have alredy been climbed here by Russian and western climbers, but still a lot remains to be done. For the second time in a few days we had to change our goals to meet the actual conditions: maybe because of El Nino, this year the weather of the range wasn't exactly the "clean blue sky" for which it's famous. The rain came every day. So, instead of new big-wall routes, we spent our time climbing enjoyable shorter routes close to the base camp. On the lower section of the Russian Tower, we followed a nice crack system that we christend "The Missing Mountain" (580m F6a/b), while on the lower section of the Central Pyramid we first climbed the slabby "A Better World" (380m F6a/b with one pitch of F6c), and then the mixed "Take It Easy" (360m F7a). All of them are excellent free climbs on red granite with knobs and chicken heads; the difficulties are mostly obligatory. We looked very carefully for any signs of preceding ascents during our climbs, but we found nothing. Regarding The Missing Mountain, we know of a route to the left of it, more in the center of the wall, just right of the white rockfall scar, that we joined in the penultimate pitch. We found one piton on that pitch, the only sign we could find. We will surely remember the ascents from this trip as much as the wonderful time spent with Artyk, our guide-cook, and our horseman and their families, who gave us a great lesson in kindness and humanity.